Never ask a woman who has just given birth when she will have another child. In the same vein, never ask a homebuyer when they will buy their next piece of property. Obtaining a mortgage after the housing market collapse can sometimes be confusing, intrusive and stressful. New federal disclosure and underwriting requirements can strike fear and annoyance in the hearts of the most experienced property purchaser. However, having a strong team that communicates, advises, and sets timelines and expectations from the outset can make a hairy process, well, a little less so. The Dodd-Frank Wall Street Reform and Consumer Protection Act was passed by Congress in 2010, and the portions affecting residential home mortgages went into effect December 1, 2015. Key features of the act were upfront fee disclosures, three-day waiting periods between disclosing the settlement statement and the actual closing, and a transfer of liability to mortgage lenders. The intent of the act was to increase client knowledge and prevent a replication of the mortgage meltdown. The overall achievement of these goals remains to be fully realized. However, if nothing else, from the borrower’s perspective, it has forced real estate professionals and closing agents to understand the process, predict potential pitfalls, and communicate throughout the process. South Carolina is an “attorney close” state, which means every real estate transaction and the drafting of related documents must be overseen by a licensed, practicing attorney. Practically, this means the attorney’s office will be examining the property and tax records, gathering and generating all the purchaser’s closing documents, receiving and disbursing the funds to everyone involved in the sale of your new property. Multi-millions of dollars of real estate and people’s livelihoods depend on the smooth and accurate coordination of this information—no pressure. The result of this requirement is that most real estate attorneys are also the title agents and title company. This legal requirement provides additional protection to a client by avoiding contract breaches, cancelled deals and liability. The lawyer will act as the coordinator for all the parties in the transaction, working with the Realtors and lenders to make sure everything runs smoothly. Effective client communication begins prior to looking at your first property. Given the underwriting guidelines and the amount of information now required for preapproval and approval of loans, establishing a relationship with a lender will set a clear budget and allow for a quicker closing date versus starting the loan process after entering into a contract. Your lender may ask for copies of the same information at different phases of the approval process. This same information may be asked for again by your closing attorney. This repetition may push the purchaser to the edge of insanity, but is intended as a safety check and internal process to assure compliance with federal and state regulations on residential mortgages and privacy laws. Luckily, most of the heavy lifting for the purchaser is up front in the mortgage application process. This allows you, the purchaser, to focus your worries and neurosis on the physical condition of the house, packing and everything that is outside your control. Your attorney and Realtor can talk you down on most of these things at either point. While your thoughts spin to the importance of your life decision and reflection of past mistakes, your closing team of your attorney, lender and Realtor will be pulling together to assure an on-time, smooth closing. 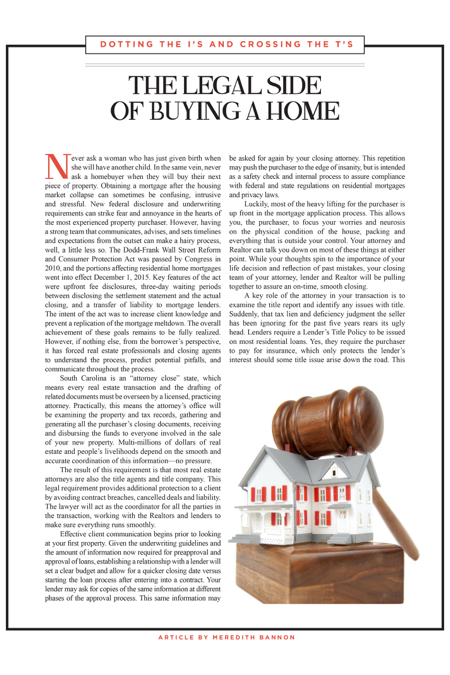 A key role of the attorney in your transaction is to examine the title report and identify any issues with title. Suddenly, that tax lien and deficiency judgment the seller has been ignoring for the past five years rears its ugly head. Lenders require a Lender’s Title Policy to be issued on most residential loans. Yes, they require the purchaser to pay for insurance, which only protects the lender’s interest should some title issue arise down the road. This requirement alone is a tipoff to the purchaser that it is a good idea to get title insurance. Owners Title Insurance is optional, but highly recommended. If both the lender and the owner receive title insurance, the purchaser will get a substantial rate discount. Title insurance is a one-time payment and will cover the purchaser should any title defects arise after the date of purchase, which existed prior to the date of purchase. Title insurance will pay for an attorney to defend your title issue and, should the lawyer lose (say it isn’t so! ), pay the owner for the loss in value that is a result of the title issue. Money may be tight during a home purchase, but this is not an area in which to skimp. Once all the fees, the pledging of the first born and ritual sacrifice have been completed, it is closing day! Since each side is represented by an attorney and meets with their counsel independently, the closing may be a little anticlimactic as usually it is just the purchaser and attorney at the signing of the documents. Just like everything, we like to do things a bit different and cannot release keys to the new owner until the seller has received the proceeds of the sale. Communicating this practice as well as other timing and practical issues is vital to a successful closing team and to avoid our clients having to sleep in their U-Haul over the weekend. As with childbirth, the end result that everyone cares about is the baby: your shiny new house. Regardless of the struggles to achieve either, six months later, neither seems that bad. And once you are settled into your new home, the idea of owning an additional piece of the Lowcountry, maybe to rent out to the poor friends and family freezing their tuckuses off up north, seems like just the perfect idea. The Bannon Law Group and our trusted network of professionals can make that happen. Bannon Law Group is located at 10 Westbury Park Way, Bluffton. For more information, visit bannonlawgroup.com or call (843) 815-4505.